Want an appetizer that will be a real crowd please? These Bacon Wrapped Sausage Stuffed Peppers are what dreams are made of… didn’t you hear the first part of the name? BACON! It will make any dish go from boring to majestic. The best part is the sausage stuffing that is mixed with my famous Mac’s Awesome Sauce that gives the peppers a creamy and almost cheesy texture. This dish is Whole30, Paleo and Keto compliant along with being gluten and dairy free. These are Whole30, Keto and Paleo compliant and are sure to be the life of the party. This may sound weird, but me and my husband thinks that they taste identical to pizza. You won’t be able to just eat one, so just fair warning, you may want to make 2 batches just to be safe. Before stuffing the pepper, I like to overcook my sausage so it is a bit crunchy. Once combined with the Mac’s Awesome Sauce, stuff in the pepper, and wrap with the bacon. When the bacon begins to cook, the grease from the bacon will drip into the sausage mixture and give it a totally different flavor. Y’all, my mouth is watering just typing this. These peppers are seriously so yummy. At my house we like to do appetizers for dinner every now and then and the other night I made these peppers along with a veggie and fruit tray and it was the perfect meal. Clean up was easy and it was fun changing up dinner. My little 4 year old thought it was so cool eating appetizers for dinner. If you are looking for the perfect appetizer for your next party, be sure to give these tasty peppers a try. 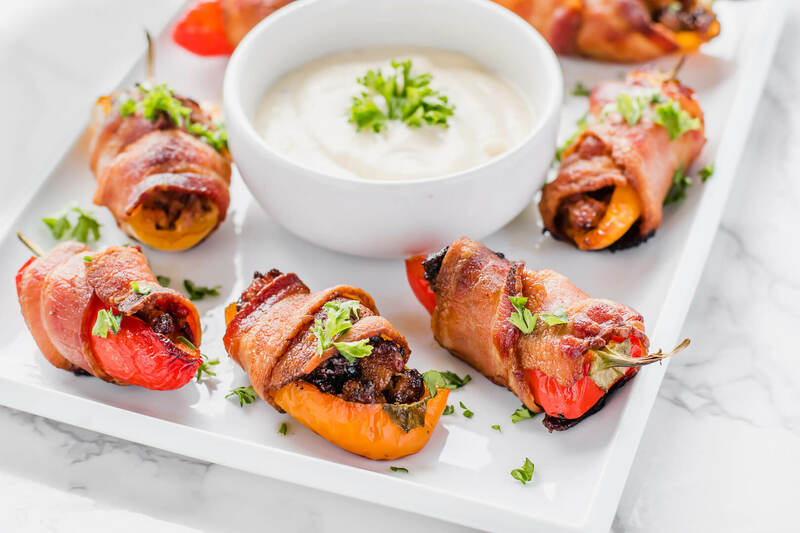 Bacon wrapped sweet mini peppers filled with a creamy sausage mixture that is Whole30, Keto and Paleo compliant. These make for the perfect appetizer. Add the pressed or finely chopped garlic clove along with the diced onions to the hot skillet. Cook until onions are translucent. Add 1 pound of compliant sausage to the onions and garlic. Cook 7-8 minutes and transfer to a large mixing bowl. While the sausage is cooking, get the mini peppers ready and make Mac’s Awesome Sauce. Cut each mini pepper in half long way. Remove seeds and membranes. Place halved mini peppers on a baking sheet, cut sides up. 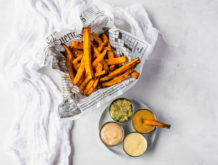 For the Mac’s Sauce: Add 1 cup of compliant mayo to a mixing bowl along with the onions, coconut aminos, salt and pepper. Mix with a spoon until combined. Add 3 tbsp (or more, depending on level of creaminess you want) of Mac’s Sauce to the sausage and mix until combined. Using a spoon, add the sausage mixture into each half of the mini peppers. Take 8 slices of bacon and cut in half. Carefully wrap ½ slice of bacon around each mini pepper stuffed with the creamy sausage. Bake for 20 minutes. Serve with the remaining Mac’s Awesome Sauce for dipping.